For the entire 54-minute run of this film, I kept asking myself, “Self, just why did you ever want to watch this movie?” And the only answer I could come up with was because it’s a longstanding alt.movies.silent in-joke. That’s not a half bad excuse, and I know I’ve seen plenty of other films for lesser reasons. The 1927 version of “The Gorilla” is lost and I have never seen the 1931 version, but the New York Times review reveals that the film has the exact same plot as “Sh! The Octopus”, except with an octopus instead of a gorilla. Another version in 1939 starred the Ritz Brothers, and allegedly caused the trio to refuse to work until their salaries were increased. By 1939, this plot was assuredly well-worn, and one wonders if the Ritz Brothers were hoping to simply avoid making the film altogether. Instead they got their raise and a re-worked plot that invoked more than a little of Poe’s The Murders in the Rue Morgue. “Sh! The Octopus” opens with Paul Morgan (John Eldredge) coming to claim an abandoned lighthouse on a tiny isolated island. A Captain Cobb (I swear he was called “Greene” in the film, but the IMDb disagrees) has escorted him to the lighthouse, and warns Morgan of Captain Hook, a sailor with a hook hand who might arrive, and who is thrown into a murderous frenzy by the sound of ticking clocks. Hook (George Rosener) does indeed arrive, just in time to find a wallet of a famous scientist in the lighthouse – this scientist has invented a radium ray. We switch to a car driving in the rain. Police officers Detective Kelly (Hugh “woo woo” Herbert) and Detective Dempsey (Allen Jenkins) are off-duty when a dispatcher calls in to say Kelly’s wife is at the hospital giving birth. Kelly seems surprised by this. He’s also nervous, so he starts taking a bunch of unidentified pills to calm his nerves. Meanwhile the car gets a flat, and while Dempsey changes the tire, Kelly reads a newspaper article about the new police commissioner going after the “crime octopus”. The crime octopus is apparently a media handle for a crime syndicate, and there’s a $50,000 reward for the head of the syndicate — The Octopus’ — capture. Suddenly a woman runs out of the forest towards Kelly and Dempsey. She says she is Vesta Vernoff (Marcia Ralston) and her stepfather has been murdered in a lighthouse nearby. She also says that her stepfather invented a radium ray and was murdered for the ray. When the cops mention the Crime Octopus, she says “the octopus” is in the basement. The two cops, seeing a chance to ingratiate themselves with the new commissioner by getting “The Octopus”, head for the lighthouse. At the lighthouse, Morgan is alone and discovers there is a dead body dripping blood and hanging bat-like from the top of the tower. There are no stairs left in the old lighthouse, however, so there’s no way to explain how the body got up there. At the same time we see octopus tentacles come after Morgan from behind a curtain, but they don’t grab him. 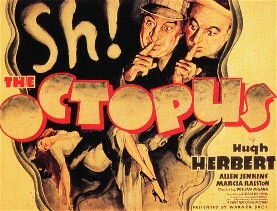 When the cops and the woman arrive, Morgan hides behind the curtain, which makes no sense – the octopus is back there! After a few moments Morgan comes out from behind the curtain. Vesta knows who he is, but he denies knowing her, which causes her to cry terribly. After Dempsey and Kelly leave to search the place, Morgan says he told that lie for a reason and Vesta should trust him. Captain Hook shows up again, this time with another lady who had grounded her boat just off the island. After she arrives, hidden stairs up to the top of the lighthouse appear, but the octopus (or at least a tentacle, we haven’t seen the entire creature yet) turns off the lights and a gun goes off. The lights come back on and Hook has disappeared. Then another person arrives, Nanny, a kindly old woman who has been Vesta’s companion for over a year. Vesta clearly relies on Nanny for emotional comfort. Dempsey decides to take everyone’s wallet, and then sends Kelly up the stairs to get the body down. Kelly drops the body on accident, which gave me the first laugh of the movie — the body is clearly a dummy, and I am not immune to the charms of a dummy falling from great heights. Dempsey realizes that’s not a real body and the blood was ketchup (he finds a full, unbroken bottle of ketchup on the dummy, which is bizarre at best), but before he can do anything about it, Morgan holds everyone up and has Vesta take the wallets back. The dummy also has a wallet. How wacky. H ook comes back, the light on the lighthouse comes on, and the octopus keeps closing and locking doors on everyone. Things really do happen that quickly in the film, and it has a very discombobulating effect. The humor is almost non-existent with the exception of a couple of one-liners and Hugh Herbert’s occasional mumbled joke, followed by a “woo woo!” Herbert is almost impossible to hear in this film. Finally Kelly and Dempsey realize that there’s “another” octopus, a real one, and they’re not dealing with the Crime Octopus at all. They decide to go into the basement to get away from some poison gas that is filling the lighthouse, but Hook doesn’t go with them. Instead, he gets eaten by the octopus. Moments later in the basement Kelly sees the octopus through a sort of window thing that looks like an aquarium, although I think it’s supposed to be a hole in the rocks that allows a view to the ocean. Meanwhile Morgan and Vesta are approached by the other woman, Polly, who asks Morgan to “play ball”. He refuses to do whatever “play ball” refers to. KELLY: Out in the ocean, under a lighthouse, with a lot of screwballs. You got that right. Finding themselves next to a small pool, Kelly is sent underwater in a diving suit to confront the octopus. The octopus is not a particularly frightening creature, as it’s difficult to see through murky water. I’m of the opinion that the murkiness was added to hide defects in the creature creation, but who knows. When they pull Kelly back up, they find Captain Hook now in his diving suit. Impossible and, most importantly, not funny. They go back to get Kelly and pull him up, and Dempsey asks him what he was doing down there. Kelly mumbles something about a mermaid’s husband which is obscured by some dubbed in “woo-woo”s. A disembodied voice tells the occupants of the lighthouse that the music they hear will be their funeral march. The only music I’m hearing is the soundtrack, but whatever – by this point, I’m used to nothing being explained to me. Kelly is left downstairs to keep an eye on things while Dempsey — the marginally smarter police officer — goes upstairs with everyone else. While downstairs, Hugh Herbert is involved in an extended sequence with a bunch of animals doing wacky things. Upstairs, we discover that no one is who they claimed to be: Morgan is an FBI agent, Hook is with the Intelligence Department, Cobb is with the International Police, and Peggy is with the Peace League and wants to get hold of the radium ray before it’s used to destroy the world. Everyone wants to find the Crime Octopus. But is the Crime Octopus even involved in this real octopus… er, thing? In the basement, Kelly hears the voice again. Then Nanny shows up and wants to look through the wallets — she says one holds the deed to her family farm. When she finds the deed, she gives it to Kelly for safe keeping. They both see the octopus, again through an odd window-aquarium thing, and she encourages him to come back upstairs with her. He does, just in time for the new police commissioner to arrive. This commissioner turns out to be Vesta’s father, but we don’t know if he was just pretending to be the commissioner, or if he’s her step-father or real father, or what. Suddenly the octopus arrives and eats Hook — again. While everyone is off guard we get the one truly surprising and scary part of the film: Nanny is the Crime Octopus! She rips off her white-haired wig as her features completely change in a really well-done sequence that’s genuinely frightening for a moment. Her friendly face turns into a nasty, mottled, grizzled countenance as she cackles and screeches at everyone. Apparently the creature octopus is under the control of the Crime Octopus, and as she backs Morgan, Cobb and the police commissioner to the door, they get grabbed by tentacles and, I suppose, eventually devoured. I’m completely okay with this. Nanny Octopus explains to everyone left that they cannot escape unless they know which switch to flip on this enormous wall of switches that we haven’t seen until now. One will blow up the tower, but one will let them escape. Surprisingly, as Nanny backs up near the door to the basement, the octopus grabs her and drags her away, too. Peggy, Vesta, Kelly and Dempsey run to the big contraption and of course flip the wrong switch. The lighthouse explodes. We fade to a scene in a hospital where Kelly is on a bed, flailing about and being attended to. Turns out he fainted because of all those pills he was taking in the car at the beginning of the movie. Vesta and Peggy are nurses at the hospital, and Kelly points this out in a manner that’s extremely similar to the final scene in “Wizard of Oz” 2 years later. So all that stuff that just happened? Never happened. Kelly’s wife has had her twins, and they go in to see the newborns, who are both actually Allen Jenkins in baby get-up, the implication being that Kelly’s babies are actually Dempsey’s. The look on Jenkins’ face is priceless. Just like throwing dummies off a cliff, the old “someone else is the father” gag never gets old to me. But then a nurse shows up and explains that the twins aren’t Mrs. Kelly’s, they’re Mrs. Dempsey’s, which causes Dempsey to faint. The dream/hallucination ending does explain a lot, but it doesn’t explain the opening sequence with Morgan, Cobb and Hook, nor does it explain how neither Dempsey nor Kelly knew their wives were pregnant. I still prefer to think of this film as an exercise in surrealism, the filmed product of a drugged-up goofy cop. It makes me happy. All in all, I can’t say that I completely hated this film. It was bad, but it was still competently made, and that goes a long way in my opinion. I’m always amazed at mistakes and carelessness in a film that was allegedly done by a good studio, with a quality cast and crew. That happened to me this morning as I was watching “Alvarez Kelly” on TCM, and saw Roger C. Carmel’s character had the worst fake beard I’ve ever seen. It was a noticeably cheap material, inflexible and crunchy, and was dark brown – Carmel has reddish hair. Did no one involved in this million-dollar film notice or care? You could tell some care went into “Sh! The Octopus”, however, as it had precious few technical problems or continuity errors. As insane as the plot got, you never saw an actor upstairs when he was supposed to be in the basement, nor were there any major contradictions. The set was sparse but decent, the creature acceptable, the filming and editing perfectly professional. After years of seeing indifference turn a decent movie into a poor one, I was pleased to see a poor movie become a decent one because of a little care and competence. My thought(s) exactly. I really, really enjoy this film. I initially sought it out because of the title…then, I watched it three times in three days. Something about it is just A-OK right. And, the professionalism helps. You don’t have to make allowances for anything in it but insanity, which is wonderful. Thanks for the good read. I enjoyed it. Is this the same octapus used in Plan 9 from outer space? I don’t think so. The octopus (the one Bela fights with in Bride of the Monster) is the one made for a 1949 film called Wake of the Red Witch. The octopus footage you see in Sh! The Octopus! is stock footage from a prior movie, though the name of it escapes me at the moment.